State workplace regulators are citing the company that hired a bulldozer operator killed during the massive Carr Fire over the summer for not having valid workers' compensation coverage. The California Labor Commissioner's Office has hit the firm, El Dorado County-based Robert Dominikus General Engineering, with $3,700 in fines in connection with violations of workplace regulations, and ordered the company to stop using employee labor until they have secured workers' comp insurance. The company had employed Donald Ray Smith, 82, from the community of Pollock Pines, who died on July 26 when the rapidly growing blaze overtook him. Cal Fire and the U.S. Forest Service require that the heavy equipment contractors they hire to help battle wildfires show proof that their employees are covered by workers' compensation insurance, which typically provide benefits to employees injured on the job and to their families, if they're killed at work. The commissioner's office says Robert Dominikus General Engineering not only did not have the coverage but also cited the company for working with an unlicensed contractor. The company has appealed the citations, according to Frank Polizzi, a spokesman for the California Department of Industrial Relations. Robert Dominikus did not respond to a request for comment. The fines amount to a slap on the wrist, according to Veena Dubal, associate professor of law at UC Hastings College of the Law. "The civil penalties imposed against these heavy equipment contractors for not carrying workers' compensation insurance are minuscule, compared with the repercussions on the families of the injured and the dead," said Dubal, who specializes in employment law. Smith was the third private contractor to die while helping state and federal agencies battle major wildfires in California in the last two years. Now the company he worked for has become the fourth heavy equipment firm to be penalized by the state for not abiding by workers' compensation insurance rules after the death or injury to one its employees. Last year, the commissioner's office fined Red Bluff-based Tehama Transport, which hired Garrett Paiz, 38, killed during the North Bay fires after the water tender he was driving in Napa County crashed. California's Division of Occupational Safety and Health (Cal/OSHA) penalized Czirban Concrete Construction, the firm that hired Robert Reagan, 35, killed in July 2016 during the Soberanes Fire. Monterey County prosecutors later filed insurance fraud and failure to provide workers' compensation insurance charges, among other counts, against the owner of that company, Ian Czirban. Cal/OSHA also penalized Groveland-based (Tuolumne County) Industrial Defense Development, which employed then 60-year-old John Tiersma, for not having workers' comp coverage. Tiersma suffered serious injuries when the water tender he was operating rolled over and down a hill that September in 2016 — also in the Soberanes blaze. 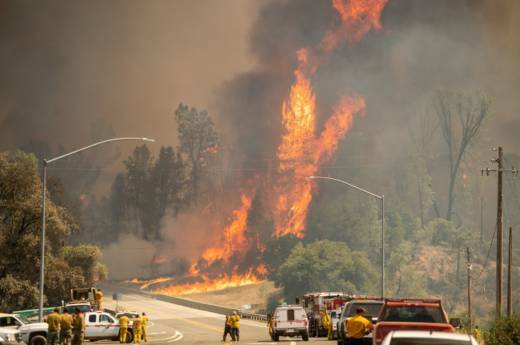 Dubal said with wildfires already a growing problem in California, state officials need to do a better job of making sure firefighting contractors abide by the workers' compensation requirements or the government should provide the benefit itself. "If the state continues to rely upon contractor labor to fight these fires, then they absolutely must ensure that those contractors and their families are covered by workers' compensation insurance," Dubal said.